Mixing a dynamic vertical animation engine with complex logic based on live data feeds, the Bell Canada VEPR client was implemented to help subscribers migrate their legacy channels into modern subscription packages in an intuitive and easy-to-use way. Above: a multi-level vertical animation system with custom motion easing make navigation simple. The selections palette remains onscreen at all time, regardless of how tall the channel selection becomes. Featuring a complex dependency hierarchy, VEPR’s success is based on the system deselecting channels that conflict with others, or selecting channels that are inclusive of another selection. 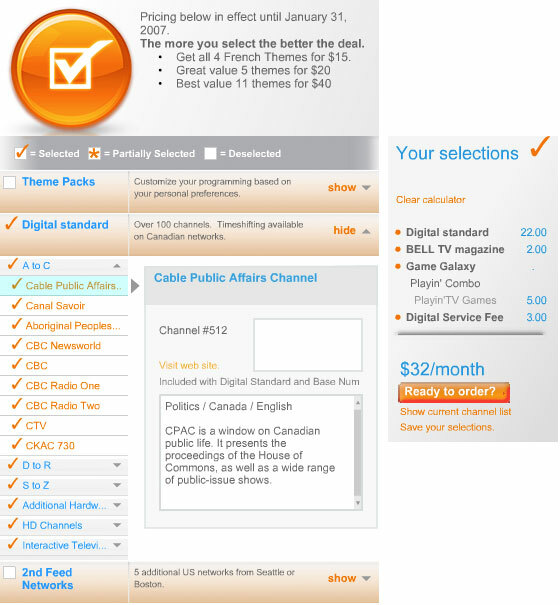 The system also calculates live pricing, and automatically upgrades channel packages if there is no cost to the user. Integrated with Adobe’s Media Server, information on each channel was available with full text, images, and video. Graphic design was handled out-of-house. This entry was posted on Thursday, October 27th, 2011 at 3:38 pm. It is filed under Visual Application Development and tagged with ActionScript 2.0, Adobe Flash 8, XML. You can follow any responses to this entry through the RSS 2.0 feed.